I’d heard some pretty far-fetched claims from my brother Roger before, but this one had to top them all. 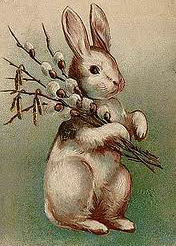 One spring morning long, long ago, he tried to tell me that our Mother was the Easter Bunny. It was a typical, cool, Lanark County spring, and I could feel the wind from the north make its way into my coat, as I jumped rope on the sidewalk in front of our house. There really weren’t many flat surfaces good for skipping, in our yard. The brownish spring grass was still wet and mushy, and the driveway was nothing but puddles all the way down the lane – soggy remnants of the melting snow. The old concrete sidewalk was definitely my best bet that day, for skipping, so that’s where I was. Jump, jump and swing the rope around; jump, jump and swing the rope around. Skipping was a pleasant activity to do when I was deep in thought, and my mind was racing a million miles a minute, on that day so long ago. It was right after Mother left the room, as we finished breakfast on Saturday morning, when Roger had leaned over, and said in a hushed voice, “She is the Easter Bunny!” Roger was older, and he knew a lot more, about a lot of things, than I did, so I tended to believe him most of the time; but this seemed pretty crazy. He had told me the summer before that I wasn’t born in the Perth Hospital like him, and that the family had found me in a cardboard box, near the railroad tracks, back the side road. I was very upset when I heard that because I’d always believed that I was the same as everyone else. Feeling ashamed, I ran outside, sat on the rope swing, and started to cry. I was still crying when Dad got home that night, so I didn’t wave at him when he drove up the lane. I was angry because he hadn’t told me the truth. Dad was smiling as he walked over to the swing, and asked why I was crying. When I told him what Roger had said, his whole face turned red, and he walked straight into the house. A few minutes later he returned with Roger, and made him apologize for lying to me. What a relief to find out that I hadn’t been found in a cardboard box, and was born in the Perth hospital, and that I was related to everyone else. Maybe this latest story about Mother being the Easter Bunny wasn’t true either? I continued to skip, and once in a while the water on the sidewalk was swept up with the rope, and splashed on me. We’d had piles and piles of snow in the yard that year, and there was water everywhere, including the sidewalk, even though I’d done my best to sweep it off. I kept hoping that the story was just made up, and I tried to think of how it couldn’t be possible for our Mother to be the Easter Bunny. There was no way that she could travel all over the world in one night, delivering chocolate. After all, it took twenty minutes just to get to Perth. It took ten minutes to get to Cavanagh’s store, in DeWitt’s Corners. It took at least ten or fifteen minutes for her to drive to Glen Tay School, and drop me off, whenever I missed the bus. There’s no way that she could cover that much territory in one night. Maybe I should just ask her, I thought to myself, but what if she is the real Easter Bunny? Would she be mad at me because I’d found out? Just as I was wondering if I should ask her, Mother opened the door, and told me that we’d be going to town soon, to pick up some things for Easter. I hung my rope over the handrail beside the steps, to dry, and came into the house. Mother already had her purse in hand, and her car keys in the other. As I headed back outside, she closed the door behind us. We stepped around the puddles in the driveway, got into the car, and she started it up. It was a wet, mushy drive down the lane-way, and the Third Line wasn’t in much better shape. Big puddles everywhere on the way to Perth, and cars splashing each other as they passed. This was the dirty part of the year; not quite winter, and far from summer; just lots of mud, water, and small piles of murky-looking snow. We drove up to Wilson Street, turned right, and in a few minutes we were parking in front of the IGA store. Mother had read in ‘The Perth Courier’ that the Easter Lilies were on sale, and she wanted to pick one up for Aunt Pat, because we were having Easter dinner at their house. We walked into the store, and the lilies were near the front entrance. We picked one up, paid, and drove back out to the Third Line. The days passed quickly, and soon it was Easter morning. There was a little yellow wicker basket at the end of my bed, filled with small chocolate eggs, wrapped in foil, and one tall chocolate rabbit, sitting on shredded green tissue, just like always. The wrapper on the rabbit said, ‘Mr. Solid’, and I peeled back the top of the wrapper, and took a little bite off of his ears. It tasted so rich and creamy that I took another little bite, wrapped him up, and set him gently on the green ‘grass’ in the basket. I put on my new Easter dress, which wasn’t really new, but was new to me, and next I put on my little white shoes, with the strap across. I took my small white stretchy gloves, and slid them on my hands. They were a little tighter than the last time I’d worn them, but they would still do. I took them off, and carried them downstairs. Mother had our breakfast on the table, and she was also getting ready for church. She had her good dress on, and was wearing an apron over it, to protect it. After breakfast we headed up the Third Line, toward Calvin Church. When church was over, we stayed in the churchyard for a few minutes, talking with our friends and neighbours, then headed back home, and had our usual bowl of soup for lunch. Later that afternoon, we headed into Perth, drove up Gore Street, and turned off onto Halton Street, where Uncle Peter and Aunt Pat lived, at house number 48. Mother had been holding the Easter lily on her lap in the car, and carried it up the steps, to Aunt Pat’s house. Aunt Pat was busy in the kitchen, preparing the ham and scalloped potatoes. We always had the same thing at Easter – ham, scalloped potatoes, and fruit cocktail for dessert; and it was always tasty. Everyone went ahead into the living room, sat down, and Uncle Peter was telling jokes, as he often did, and kept everyone laughing. I stayed behind in the kitchen, with Aunt Pat, and waited until no one else was around. I asked her the question that had been bothering me all week. “Aunt Pat, is my Mother the Easter Bunny?”. What a relief! I finally had my answer, and now that I did the question seemed ridiculous. My hunch was right all along, that Mother wouldn’t have time to deliver chocolate to everyone in the world. It was just another ‘creative’ story from Roger. I would be more careful in the future not to believe his wild tales. Aunt Pat, had solved the mystery, and this little girl became a wee bit more skeptical. In the years that followed, I had many memorable times with my older brother, and as the decades passed, he became a great friend, and a good-hearted companion. When all is said and done, we have our older siblings, as well as the local school-house pranksters, to thank for our healthy sense of skepticism, and the way it shields us from modern-day predators……. so much bolder and more cunning, than the early ones we encountered, on the Third Line. This entry was posted in Short Stories and tagged 48 Halton Street Perth Ontario, Arlene Stafford-Wilson, Arlene Stafford-Wilson Easter Tale, Calvin United Church Lanark County, DeWitt's Corners, Easter Bunny Lanark County, Easter Bunny Perth Ontario, Easter Bunny Tay Valley Township, Easter stories Lanark County, Easter Traditions in Canada 1960s, Glen Tay Public School, lanark county history, Lanark County History Bathurst Township, Patricia Stafford, Peter Stafford, Roger Stafford, Tay Valley Township history, Third Line of Bathurst. A nice little story, Arlene. Isn’t it interesting – the things that shape our personalities!